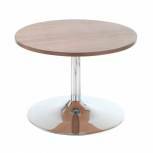 Arista Beech/Chrome 800mm Round Bistro Table KF815146 Pack of 1 Arista Bistro Table with stylish beech finish top and a sturdy chrome frame. Dimensions: W800 x D800 x H740mm. For matching chairs see KF03363. Non returnable. 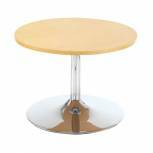 Arista Round Bistro Table Top Pk Beech Pack of 1 Modern design looks stylish in any office. Smooth spacious table top provides plenty of room. Easy to wipe surface for quick cleaning. Circular shape for multiple users. Table top only - base sold separately. Finish: Beech. Non returnable. Arista Round Bistro Table Leg Pk Chrome Pack of 1 Carina round bistro table leg pack. colour: Chrome. Non returnable. Arista Small Table Trumpet Pole Chrome KF72353 Pack of 1 Trumpet pole for Arista Small Table. Pole only: requires top and base for complete table. Sturdy materials ensures lasting performance. Finish: Chrome. Non returnable. Arista Bistro Trumpet Base Chrome KF72354 Pack of 1 Trumpet base for Arista Bistro table. Combine with Bistro table top and trumpet pole for complete item. Sturdy and reliable for long-lasting use. Finish: Chrome. For use with KF72148. Non returnable. 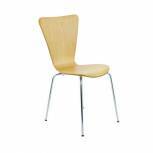 Arista Beech/Silver Picasso Wooden Chair (Pack of 4) KF72460 Pack of 1 Arista Picasso Wooden Chair. Stylish bent wood stackable chairs. Dimensions - Seat W440xD380mm, Back W430xH400mm, Height 475mm. Finish - Beech/Silver. Set of 4. Non returnable. 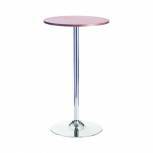 Arista Beech/Chrome 600mm Tall Bistro Trumpet Table Beech Kf838281 Pack of 1 Arista Tall Bistro Trumpet Table. 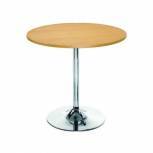 Versatile tall table with circular Beech top and chrome stem and base. Diameter 600mm x H1050mm. Arista Beech/Chrome 800mm Small Bistro Trumpet Table KF838282 Pack of 1 Arista Small Bistro Trumpet Table. 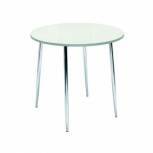 Versatile tall table with circular Beech top and chrome stem and base. Diameter 800mm x H740mm. Non returnable. 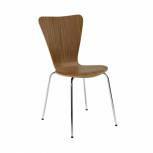 Arista Walnut/Chrome Wooden Bistro Chair (Pack of 4) KF72578 Pack of 1 Arista Wooden Bistro Chair. Multi purpose stacking chair. Sturdy chrome frame. Complements 4 leg table (KF838316). Seat: W440 x D380mm. Back: W430 x H400mm. Seat height: 475mm. Colour: Walnut. Non returnable. Arista Bistro Table Top 800mm Walnut Ch0675Wa Pack of 1 Bistro table top. Part of the modular Arista Bistro system. Legs are required for the full table. Circular shape. Finish: Walnut. Diameter: 800mm. Non returnable. 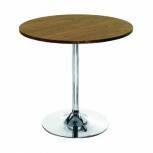 Arista Walnut/Chrome 800mm Round Bistro Table KF838316 Pack of 1 Arista 4 Leg Table. For use in bistro/canteen environments. Dimensions: Diameter: 800 x H740mm. Use with Arista bistro stacking chairs (KF72578). Colour: Walnut. Non returnable. Arista Walnut/Chrome 600mm Tall Bistro Trumpet Table KF838317 Pack of 1 Arista Trumpet Base Tall Table. For use in bistro/cafe environments. Dimensions: Dia: 600 x H1050mm. Use with Arista bistro gas lift stools (KF72579). Colour: Walnut. Arista Walnut/Chrome 800mm Small Bistro Trumpet Table KF838318 Pack of 1 Arista Trumpet Base Table. For use in bistro/cafe environments. Dimensions: diameter:800 x H740mm. Use with Arista bistro stacking chairs (KF72578). Colour: Walnut. Non returnable. 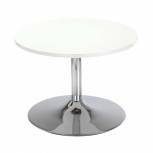 Arista White/Chrome 800mm Round Bistro Table KF838543 Pack of 1 Arista Round Bistro Table with stylish white high gloss top and chrome legs. Overall dimensions: W800 x D800 x H740mm. Non returnable. Arista White/Chrome 800mm Small Bistro Trumpet Table KF838544 Pack of 1 Arista Small Bistro Trumpet Table White Small table: Dia. 800 x H740mm. High gloss top in white. Chrome base. 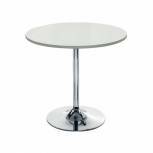 Arista White 800mm Low Bistro Table with Trumpet Base KF838812 Pack of 1 Arista low bistro coffee table with chrome trumpet base. Suitable for use with low seating and reception areas. Dimensions: H420mm x Diameter 800mm. Finish: White. Arista Beech 800mm Low Bistro Table with Trumpet Base KF838813 Pack of 1 Arista low bistro coffee table with chrome trumpet base. Suitable for use with low seating and reception areas. Dimensions: H420mm x Diameter 800mm. Finish: Beech. 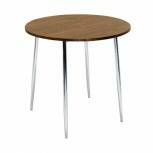 Arista Walnut 800mm Low Bistro Table with Trumpet Base KF838814 Pack of 1 Arista low bistro coffee table with chrome trumpet base. Suitable for use with low seating and reception areas. Dimensions: H420mm x Diameter 800mm. Finish: Walnut.